A morning dedicated to nature and animals, together with the family to get closer to the equestrian world. You’ll visit the new farm in Pian the Schiavaneis where you’ll find horses, ponies and other funny animals; the children can have their first riding experience. After a snack you will enjoy a short horse riding trip in the woods at the foot of the Sella mountains before returning to the hut; receiving a memorial photo of the tour. Expected return: about 1.30 p.m.
Price: 35€ adults, 25€ children. 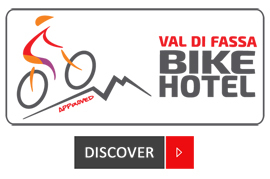 10% discount for Val di Fassa Card owners. Summer Outdoor Price: 25€ adults, 15€ children. The price includes the visit at the little farm, pony ride and snack for children, short horse riding trip in the woods for the whole family). 5€ discount for those who doesn’t want to take part to the horse ride in the woods. Excursion to discover the undergrowth and its wellbeing philosophy with the “barefooting”. Experience regenerating sensations by walking barefoot in the wood. Meeting point: 9.00 a.m. Sport Check Point Moena. Expected return: about 12.00 a.m.
Price: 15€ adults, 6€ children from 8 to 12 years. 13€ adults, 5€ children with Val di Fassa Card. Summer Outdoor Price: 5€ adults, children for FREE. We will explore the First World War Trenches in the area of Padon equipped with helmets and headlamps. We will visit the Marmolada glacier accompanied by the Mountain Guides. Meeting point: 9.00 a.m. Sport Check Point Canazei or 9.30 a.m. departure of Padon Chairlift at Fedaia Pass. Expected return: about 15.30 p.m.
Price: € 25 adults, € 10 children (up to 12 years old). € 22 adults, € 9 children with Val di Fassa Card. Summer Outdoor Price: 12€ adults, children for FREE (up to 12 years old). Note: Lift ticket not included in the price. Spend a day at the farm, meet our animals and take part in workshops. For children and adults. You will learn about the seasonal produce of the Val di Fassa and enjoy a meal which we will cook together. Expected return: about 3.00 p.m. Note: Lunch and material for the activities are included in the price. Children must be accompanied by adults. build a small wooden hut that will be our shelter for lunch. Meeting point: 10.00 a.m. Sport Check Point Pozza. Expected return: about 2.30 p.m. Meanwhile parents will have the opportunity to relax at the nearby new QC Terme Dolomiti. Summer Outdoor Price: 5€ children. Note: This activity is reserved to children from 7 to 14 years old, bring your own packet lunch. Discount for QC Terme entry included. there will be no altitude drops, you’ll walk slowly and together. Activity for both adults and children, in collaboration with Teseo project. Meeting point: 10.30 a.m. Sport Check Point Campitello, for adults and children. Expected return: about 12.30 a.m.
Meeting point: 2.30 p.m. Sport Check Point Pozza, only for children (min age 7 years). Expected return: about 4.30 p.m.
Price: 12€ adults, 7€ children. 11€ adults, 6€ children for Val di Fassa Card owners. Summer Outdoor Price: 6€ adults, 3€ children. Note: prices include map and compass. Chalet Valbona. Followed by didactic workshop and activities for children. Meeting point: 9.00 a.m. departure of Alpe di Lusia cable car. Expected return: 5.00 p.m.
Summer Outdoor Price: 20€ adults, 12€ children from 8 to 16 years and 6€ children under 8 years. Note: Lift ticket, lunch and guide included in the price. Excursion not suited for strollers. in complete safe accompanied by the Mountain Guides. Meeting point: 8.45 a.m. Check Point Canazei. Expected return: about 3.00 p.m.
Price: 85€ adults, 55€ children. 80€ adults, 50€ children for Val di Fassa Card owners. Summer Outdoor Price: 55€ adults, 35€ children. Note: Max 5 persons per guide. Lift ticket or eventual bike rental non included in the price. Bring your own packet lunch. Summer Outdoor Price is dedicated to the guests of Sport & Outdoor accommodation facilities.